What Should a Stereo System Do for You? We've all had that feeling of anticipation in the concert hall when the lights go down and the first musical notes start issuing from the orchestra or band. Music is a language that can stir your soul and transport you to the land of a composer's imagination. A stereo system is the technology that lets you recreate that same magic in your own living space by immersing you in the sound field produced by two loudspeakers and associated equipment. A properly-designed, state-of-the-art stereo will disappear from your room and leave you with a breathtaking and realistic image of the performers playing their music right in your room. If the system is designed to be accurate and natural and to adhere to certain core values, then it can accomplish this magical illusion even though it won't require you to take out a second mortgage to purchase it. 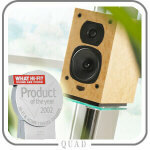 Loudspeakers: These can be bookshelf or floor-standing models. In general, both types can be excellent reproducers of sound, but the larger the loudspeaker, the more bass and dynamics it will have. If a loudspeaker is too small to produce adequate bass in a given size room, the bass can be augmented with a subwoofer that carries the lowest musical notes. However, the proper matching and integration of smaller loudspeakers and a subwoofer can be a tricky task to accomplish. Thus, a satellite/subwoofer combination should be reserved only for those situations where two full-range loudspeakers just can't be accommodated. In-wall and in-ceiling loudspeakers should be reserved for those situations where only background quality is required. Enclosing the loudspeaker components in a large wall makes it impossible to recreate a convincing illusion of the original musical performance that has the proper spatial information, no matter how good the parts used in those loudspeakers. Electronics: Originally, the main electronics of a stereo system were divided into three parts: (1) a tuner to receive radio stations, (2) a preamplifier to provide initial amplification, volume control, and source selection, and (3) a power amplifier to provide the raw horsepower (watts) to drive the loudspeakers. These components can use either vacuum tubes or transistors for their amplification circuitry. Some people will be surprised to learn that many audiophiles and music lovers still consider the sound quality of tubes to be superior to that produced by solid state. Combining the preamplifier and power amplifier into a single unit yields an integrated amplifier, and combining all three yields a receiver. While a reasonably good sound quality can be obtained from such a receiver, the main advantages of a receiver are lower cost and fewer components. There is little doubt, however, that significantly better sound quality can be obtained from separate components. An "ultimate" stereo system, one designed to allow the walls of your listening room to fall away and to transport you to the performance, will inevitably use individual components. Nevertheless, one can build quite an excellent system around a receiver, as long as that receiver is selected for the best possible audio performance. Glitz and superfluous features degrade the sound and drain away money that could, otherwise, be used to improve the design and parts quality. Music Sources: Next, you'll need one or more music sources such as a CD player, turntable, music server, and/or tuner (if you're not using a receiver). Turntable, you say? You bet. Although CDs have been around for about 25 years, it's astonishing how much more realistic and natural an LP can sound when compared to a CD. True, LPs aren't as convenient as CDs, but many music lovers and audiophiles still turn to their record playback equipment when they want the best sound out of their stereo systems. That's why there's still a very active turntable market in this digital age. Whichever sources you choose, they all get connected to the receiver, preamplifier, or integrated amplifier which is used to control which source is playing. Cables: Finally, you'll have to hook all of that equipment together with component interconnect cables (component to component) and loudspeaker cables (amplifier or receiver to loudspeakers). The quality of the cables you use has a significant impact on the total sound quality of your system, so you should never use those low-quality, giveaway cables that are packed in with some components. You don't have to spend a fortune on cables, but neglecting this aspect of your stereo system will most definitely compromise the resulting sound. There are quite affordable audiophile-grade cables that are very appropriate for entry-level audiophile systems. Of course, there are also much more expensive, higher end cables for very high performance systems. We will always be glad to help you select the appropriate ones for your system. 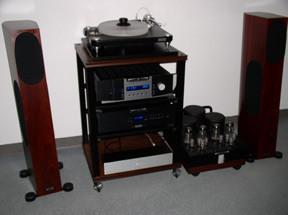 Most of the above discussion relates to the hardware you'll need for your stereo system. But music isn't hardware, it's artistry and emotion combined into a unique language that must be spoken clearly and accurately, with the least possible "accent" (distortion), if it's to be understood and appreciated. When music is played in a live performance, there's no "accent" to alter the sound you hear. Musical timbres are in proper balance, dynamics (volume changes from softest to loudest) are not squashed or magnified, and the acoustic space (imaging and ambience) is as wide open as the performance venue permits. When we evaluate a stereo component or design a system, we always work towards minimizing the "accent" so that the musical message emerges from the stereo system as clear and ungarbled as it went in. That's what we meant up above when we referred to "core values". No matter what price range system you're looking for, the first thing we look for is midrange neutrality, absence of sonic aberrations at all frequencies, and the kind of clear, open, and spacious sound we experience at a live concert. How do you get all of these parameters balanced and integrated? Well, we think we can help you do that by working closely with you and considering your needs and the layout of your listening room. Auditions in the store are, as always, the best way to decide on what components are right for your needs. A well-designed stereo system can create a gathering place for your entire family and friends. Performances come alive, right in your own home, with the drama and nuances of the original event alive and intact. The only thing that's better is going to the live concert!